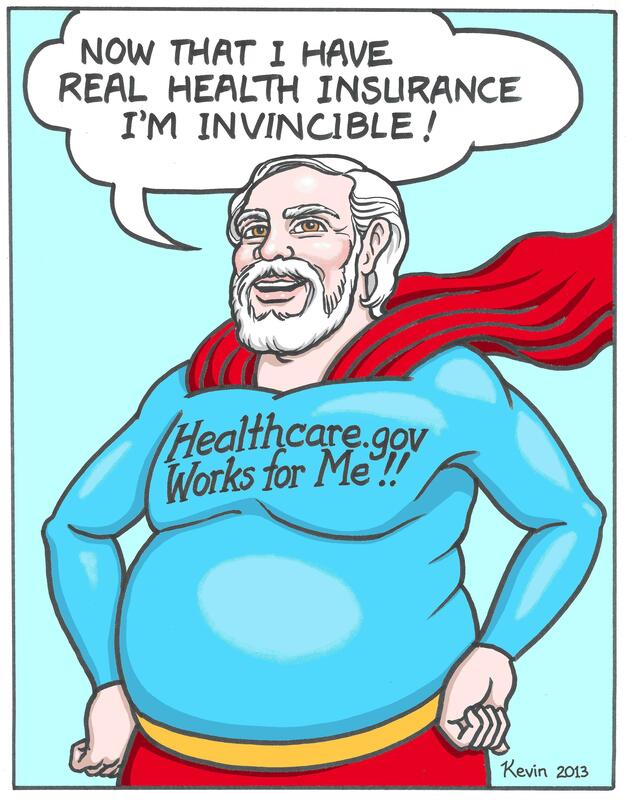 When I succeeded in securing health insurance on line at healthcare.gov, the thought fluttered through my mind that now, with REAL health insurance, I would live forever in good health. Virtually all the news commentators throughout the known media universe have been screaming for months about how the Affordable Care Act enrollment website, healthcare.gov, has not been working perfectly. As a 64-year-old man with an analog brain, who NEVER manages to get electronic technology to work the first time, I was not surprised or alarmed that the website wasn’t working well in October. Even though I am one of the millions of Americans whose health insurance companies deliberately downgraded our insurance to junk status so that it would be cancelled for not meeting ACA standards (scroll down several posts to read the whole story,) I figured I had until January 1 to secure REAL insurance through the Affordable Care Act, and if the website did not work for me, then enrollment by phone or an actual person-to-person interview would certainly do the trick. What was all the fuss about anyway? Smells like sour grapes to me. The administration said that most of the website glitches would be resolved by the end of November, so I waited until the day before Thanksgiving to make my first attempt at starting to secure REAL health insurance on line. After only three hours I had managed to create my profile and my account, provide my financial information, and study the details of some of my early leading candidates for health insurance. No problems whatsoever. I was impressed. And, by the way, if an old technophobe like me can do this without any difficulty, then the website is extremely user friendly, and most people will succeed in a fraction of the time I invested. The day after Thanksgiving, while others were shoving and punching each other to gain an advantage in the Black Friday super-consumer frenzy, I quietly resumed my online health insurance quest and was once again very pleased with the experience. I spent a grand total of about seven hours on healthcare.gov, mainly reading about the scores of possible insurance programs I could consider. During that time I probably logged on and off about seven times without any difficulty. Between sessions I made two calls to the Affordable Care Act phone line: 1 800-318-2596, to ask some basic questions. They were very helpful. I also called several insurance providers to clarify their options and make sure my local doctor and hospitals accepted their coverage. I ended up getting in my car and driving to my doctor’s office to talk face-to-face with his receptionist. I really like Dr. Carl Brango, and I wanted to be extra sure that the plans I was considering were okay with him. I was sorry to see that dental and eye care insurance did not seem to be offered by any of the plans, but finally, I made my choice, triple checked it, and clicked on “ENROLL.” A message immediately flashed on my screen – something like, “Are you aware that you are eligible to select very similar group plans that are more affordable?” Well… no… I had missed that part of the information, because I had just assumed that the more expensive policies would be more comprehensive. Not so. I voided my first choice and did more research, discovering a very similar plan for $110 less per month than the one I had originally selected, offered by the very same company! But the best news of all is that after many years of paying over $550 per month for fake health insurance that could be cancelled or changed at the whim of the insurance company, as it was recently, I will now have much better health insurance for half that price. Icing on the cake: After I made my final health insurance selection, healthcare.gov delighted me with an option to buy affordable dental insurance as well. I am ashamed to admit that I haven’t been to a dentist in years, despite some pretty serious dental problems. Now for less than $23/ month, I will be able to see a dentist as often as I wish. I clicked “CONFIRM” to activate all my choices and received congratulations from healthcare.gov, telling me that I had successfully enrolled in health insurance and dental insurance that would begin January first. Ironically, on January 15th I will begin researching my healthcare options all over again, because I will be eligible for Medicare starting March first, since I will turn 65 in March, and they recommend beginning the process of applying, choosing a plan and securing supplemental insurance, six weeks before the program starts. I don’t mind. I am just so relieved to have REAL health insurance after decades of paying high prices for fake insurance in the individual market. I will no longer have to lie about my family health history or hide my own pre-existing conditions from my health insurance provider. I won’t have to go to free clinics or university health studies or pay for secret medical services out of my own pocket to prevent my health insurance provider from finding out about a condition and potentially canceling or changing my policy. I will have REAL health insurance that I can use without fear of cancellation or policy change for two months through the Affordable Care Act. Thank you President Obama! And then I will be covered by Medicare for the rest of my life. Thank you President Johnson! When the congratulatory statement from healthcare.gov appeared on my screen, I was elated, and for just a brief instant I felt the invincibility of youth again. I sensed just a hint of a taste from the Fountain of Youth. The thought fluttered through my mind that now with REAL health insurance I would live forever in good health. After all… that is certainly what REAL health insurance would do for us, right? It would insure that we’d live from now on in a state of perfect health. Alas, the fantasy lasted only an instant before reality closed in around me again – mortality. An old monk once told me, “The body has to find some excuse to go.” And besides, the science of medicine may be doing some wonderful things, but it is still in its infancy. Too often today’s cures are as lethal as our diseases. Sadly, health insurance does not insure our health yet. But at least it may finally begin to insure that we can all get the basic healthcare we deserve as a human right, when we are physically ill or injured. This tremendous benefit has been a long time coming. From my point of view it was well worth the short wait while a few website bugs were resolved. Check it out… healthcare.gov works! I realize how old I’ve become when I hear younger people talking. Not that I have all that much of an opportunity to hear them, I should add. The majority of our friends are people who are probably within a decade or so of our respective ages. And most of them speak more or less the way we do. Really, no worries? I do not think he ever used the expression “you’re welcome,” or “certainly,” or “my pleasure,” or even the more off-handed “sure!” No, instead each time we were counseled not to worry. I found this both amusing and, frankly, somewhat disconcerting. I mean, where could such an expression have come from? Why would it ever even occur to me to worry under such circumstances? And why did our thanking him, perhaps an unnecessary politeness on our part, some may even argue, since he was merely doing his job, ever make him suppose that all this might possibly engender worry on our part? I practically expected him to address us as “dudes,” another expression of the young, which applies a new meaning to an older term. This is a word, as is well known, that has its own history. A dude, once upon a time in the 19th century, referred to an individual who dressed in inappropriately fancy clothing, especially one from the East who found himself in the Western part of the country. It was more or less synonymous with dandy, and was never used as a compliment. Nowadays, among other uses, it appears to signify a kind of bonding notion between young men, in particular young straight men, who – from what I can tell – use it to signify a type of closeness or camaraderie, but with just enough distance built in so as not to imply too much intimacy. This way, sufficient heterosexuality can be assured, no one feels too uncomfortable, and an intimation of completely nonsexual friendship is always implied and maintained. I am not an expert on this, but the word does seem to vary in its connotations, depending on the intonation used. Drawn out and pronounced with a higher pitched tone on the first syllable and a lower tone on the second, as in “DO-ood,”it can imply a kind of dubiousness, or even a questioning of motives or veracity, as in “DO-ood, come on!” By contrast, spoken with a sharp, snappy intonation, as in “Aw, dude, that’s awesome!” it can connote congratulatory praise. The term “bro,” too, might in some contexts be thought of as a reasonable synonym (see also the November, 2013 issue of “The Atlantic Magazine” for J. J. Gould’s entertaining piece on this topic, entitled “Dude Transcends). Which brings me to another least favorite word of mine, namely, “awesome!” It seems to me that there are, in fact, very few things in life that actually deserve this appellation. Although I do not come from a Protestant background, I have heard that there is a hymn sung commonly within such religious traditions that speaks of the “awesome wonder” of the shining stars and the rolling thunder. And yes, I agree that these are indeed awesome, but probably not the touchdown on the part of your favorite team, or the steak you have just consumed, or even that girl in the red dress on the other side of the bar. “To die for” is yet another expression in regard to which I may well expire in anguished exasperation, myself, if I hear it too many more times. It is my understanding that this overblown, overused, and overbearing term began originally among gay men, but has now migrated willy-nilly to, and has regrettably ensconced itself among, the population at large. For very few things ought one to be willing to die before one’s time, it seems to me, and most of these have to do solely with what would, let us hope, be only of the greatest benefit to humankind, or to the poor, suffering planet on which we live. As implied perhaps above, I do not mean to pick on young, straight men exclusively either. Surely, gay men, too, have their deplorable darlings, some of which, in my view at least, are as inane, insidious, and annoying as anything a straight “awesome dude” might ever come up with. If, for example, I never hear the word “fabulous” again for the rest of my life, I will count myself among the blessed. Especially, when pronounced “FAB-ulous!” Again, very few things in this world are worthy of being so described, and certainly not a shirt, a TV show, or the latest designer drug. I could possibly tolerate a sunset being labeled fabulous, but would, I think, always prefer any one of the following in its place: stunning, spectacular, glorious, or even, yes, awesome! There are other words and expressions, as well, that could be listed. Probably more than are worth noting. But among those I personally find anywhere from mildly annoying to downright offensive, I include “girl friend” (used by one gay man to refer to another), “zhoozhed” — a truly regrettable neologism, in my view — and “bling” (the latter, again, seems to have also migrated to a wider usage) referring, I suppose, to stylish clothing and jewelry respectively, and the ubiquitous but nonetheless offensive “fag hag” (a straight women, who hangs around rather too frequently and exclusively with gay men). It’s not that I have anything against slang. Slang is, after all, one of the ways in which we can tell that a language is still vibrant and whole, that it continues to serve the needs of its users in their everyday lives and experiences. There is, for example, no current slang usage in Latin, nor – sadly – probably in many of the languages of indigenous peoples the world over, which are slowly dying out. As with most things in the world, such change is a not just indicative of, but it is the very prerequisite and essential precondition of a living entity. In this sense, my railing against the apparent gradual loss of the objective case, when it comes to the use of personal pronouns after a preposition, is probably as quixotic as it is futile. What I’m referring to is how common it now is to say, as an example, “that was the case for Susan and I,” which still rankles, I have to admit (I even have trouble writing it as an example! ), instead of the apparently older fashioned and more correct, or completely correct, “for Susan and me.” And I cringe whenever I hear anyone say, “well, that’s just between you and he,” although for the most part, I have given up on correcting anyone. Who knows? Maybe fifty years from now, “no worries” will be considered as appropriate a reply to “thank you” as “you’re welcome” is now thought to be. From my point of view, I have to admit that I hope not. But more than one person in my life has accused me of “not being with it” in my grumpy and antiquated manner of both writing and speaking. OK, I still can’t stop myself. I’m NOT worried, I want to say. All I’m trying to figure out – and can anyone enlighten me, please? – is why a simple “thank you” ought ever to result in any amount of perturbation, distress, or concern (i.e. worry) on the part of one so thanked. But now I really will stop, go get all zhoozhed up, and put on my bling too – that is, I mean, if I had any. THE CONVERSATION I HEARD ONE DAY ON THE GYM FLOOR, OR WHAT DOES IT MEAN TO BELIEVE? I try to go to my gym at least four or five times a week. The idea is to keep the blood flowing through my 69 year old veins, so as to avoid another heart attack (I’ve had two). So far, it seems to be working pretty well. The particular gym I go to is part of a local Jewish Community Center. I’ve heard that about half of the people who attend it are Jews, and the other half are not. So, when I overhear things while working out, I’m not normally particularly aware of who is saying what. However, not long ago, I did hear a conversation between two middle-aged women, both of whom, it soon became obvious, were Jewish. One of the women was telling the other that she and her family did not attend temple anymore. The other woman said she didn’t either, but both quickly assured each other that it was still important for them and their children to identify as Jewish, and in some sense to follow the traditions. Now, I pretty much keep to myself while on the gym floor, and prefer not to stand around chatting. After all, that’s not why I’m there. So, even if I’d known these women, which I did not, I probably wouldn’t have said anything. Besides, I’m not Jewish, so in that sense what they were saying was none of my business. Or was it? I began thinking later on what it meant to have a religious identity. These women, and presumably their spouses and children, clearly identified as Jewish, but they went on to say that they didn’t particularly believe in God anymore. That was interesting, I thought, because I think of myself as having no religion at all, and yet I do believe in God. Once upon a time, in what now seems like the far distant past, I strongly identified as Roman Catholic. Indeed, specifically Irish Catholic, if that makes sense. For me at the time, what this meant was strict adherence to religious dogma, trust and reliance on the hierarchical model of the Church, and a strong belief in and reliance on some of the more devotional aspects of the Church, things like saying the rosary, prayer to the Blessed Mother and the saints, and attendance at such services as Benediction (the reverential viewing of the Eucharist, accompanied by set prayers and hymns, all in Latin at the time). In fact, these devotional practices somehow took on for me an even greater importance than the Mass itself or the sacraments. And I think that was not so unusual among old-fashioned Irish-Catholics. What happened between then and now is a long story. But it involves a lot of anger and disillusionment on my part, disenchantment at what I came to see as the profoundly uncharitable nature of the Church, and recognition of its doctrinaire rigidity that brings so much unnecessary pain and suffering on so many people. In the course of throwing off religion, I became for a while what I thought of as an atheist, although it soon became clear to me that this did not suit me very well. I still, by the way, admire atheists, inasmuch as for me at least they represent the utter no-nonsense view of life as it is lived in the here and now. I came to see that many atheists appeared to be more moral than some religious people, certainly than many dogmatists and religious fanatics, and that they were willing to face the ultimate questions with admirable honesty, courage, and directness. I don’t mean to say that I wish I were an atheist. If I wanted to, I would simply be one. Still, as I have said, I admired them, and still do. Does it seem surprising that I – a professed “believer” – would admire someone who professes not to believe? I hope not, because doubt, and wonder, and an awe that, as it were, strikes one dumb, are basic to what I see as a belief in a Divine Spirit. And lots of atheist, I think, look at the world with awe and wonder, and yes, probably sometimes with doubt too. After all – or am I imagining it? – doubt is not limited only to religious believers. Absolute sureness, with never a moment’s hesitancy or uncertainty, is the property only of total blind faith. But in this sense, atheists too “believe in” their atheism and perhaps – like many of us – occasionally have their own doubts about what they believe. Faith does not eschew our need to question. Still, it was interesting that the two middle-aged ladies in my gym continued to very much consider themselves Jewish, even though, as they averred, they had no faith in God. Of course, much has to do with people thinking of being Jewish not merely, or solely, as a religion, but as an ethnicity, as being part of “a tribe,” as it were. For me, too, I still think of myself as Irish-American, since believing or not believing should in principle have little to do with that identity. I still have an interest in Irish history, literature, mythology, and even, fleetingly, the Irish language. And yet, I have to admit to myself that something has changed for me, that in some sense I no longer feel quite as Irish as I once did. And I wonder if my gym partners, too, somehow were not protesting just a little too much about still feeling perfectly Jewish either. I’ve come to my own conclusions about spirituality, and am convinced that it does not necessarily have anything whatsoever to do with religion. Religion is about organization and laws and rules, things of the earth, human things. Sometimes, too often in fact, it’s also about control of people, about power and authority. And in emphasizing these things, religion all too often leaves out that awe and wonder, that inability to define what is ultimately indefinable and unutterable that to me identifies what I think of as true spirituality. But the wonder about religion, and about identity, has not left me. Nor the wonder about atheism either, because as I see it atheists are believers in the sanctity of the manifest world, while adherents of spirituality are believers in what is unmanifest. However, I do not see the two as all that different, because at least for me the Unknowable Unmanifest permeates, pervades, and informs all the known manifestation of the natural world. So, why talk about all this in the first place then? Why wonder about religion, atheism, identity, or even spirituality? There may be as many answers to that as there are people who think about such things. My take on it is that there has to be some connection, some balance, between whatever your belief may be (and remember, I list atheism as a kind of belief) and how a person acts in the world. It’s no more enough to only sit in the forest and meditate than it is to go to a church, or simply to deny the existence of a God. In every case, we have bodies, we live in a physical world, and it is our duty to make the most of that. Making the most of it, in fact, means fulfilling our own potential as much as possible, and treating others, indeed treating the whole world (I mean the physical planet) respectfully, even reverentially. I hope no one misunderstands me: nobody has to be – or should ever be – anyone’s doormat. Neither should we go looking for trouble, and we ought instead to go about creating as little trouble in the world as possible. I have the sense that behavior is more important than belief. Life is not easy for anyone. Who does not have trials and difficulties to face, everything from sickness and physical suffering to loss of those whom we love? Who among us can say there are no personal battles to fight, no wars to engage in, many of which are waged right within our own psyches? I often think of the Bhagavad-Gita in this regard, the great Hindu scripture, wherein at the beginning the blind king, Dhritarashtra, asks his seer to describe to him the scene on “the scared plain” before them. On one level at least, the Bhagavad-Gita is the story of a battle between two warring royal families. But metaphorically it describes the battles we all have before us on “the sacred plain” of our lives. No one, however fortunate we may think that person, escapes these battles. The Jewish ladies in the gym were talking about one tiny skirmish, but each of us has his own challenges, her own grief, great or small, at varying times in life. So, belief may be a good thing, as long as we do not use it as a cudgel to beat other people up with. And, as I said, who does not believe in something, even in his right and ability not to believe? As I see it, whatever it is you may believe, in the end there are a few essentials that should always be kept in mind: don’t behave badly, treat others with compassion and respect, and in whatever way possible do everything you can to leave this beautiful planet of ours a better place than you found it. What more can be asked of us? What more, in fact, can any of us do? President Obama’s strategy behind his news conference yesterday, Nov 14, 2013, was brilliant. The untold story of this botched “Obamacare” role-out is the opportunistic actions of the health insurance companies who created the cancelled policies part of the problem. They lunged at the opportunity to purge undesirables from their client ranks by simply rewriting their policies to levels below Affordable Care Act compliance, so that those policies had to be cancelled. This is exactly what they did to me and many others. I think I will frame my cancellation letter as proof that we in the individual market have never had real insurance, because our health insurance companies could change or cancel our policies any time they wanted to. That’s not insurance… it’s a scam! Mr. Obama is smart enough to know that he could not just directly expose the health insurance industry as the culprits behind this part of the ACA role-out debacle without creating a booming outcry about sour grapes and buck-passing. So, instead, he very wisely took all the blame on himself, appearing and sounding more contrite than any other president in my lifetime, even though almost every single one of them had many more reasons for sincere contrition than the current president. President Obama’s self-effacing and self-sacrificing platform of humble contrition allowed him to say that if the insurance companies wanted to reinstate us — the 2 or 3% of self-insured Americans whose policies they have cancelled — and if the state healthcare commissioners will approve it, then he is all for it. In one deft move Mr. Obama shifted the blame for these cancellations from himself back to their rightful source, the insurance providers, and he did so without appearing to try to pass the buck or deny his responsibility for this mess. Of course the health insurance industry began screaming bloody murder within minutes of the president’s statements. They thought they had gamed the system to get rid of old farts like me, who are bad risks, without taking a public relations hit. Now the onus is back on them, where it has always belonged, and they don’t like it. They thought they had found a free windfall, but now they are whining that they may need to raise everyone’s rates if they have to keep people like me on their roles, again trying to blame the president for their own greed. Well, I have good news for them. I have no intention whatsoever of remaining a client of Blue Cross, who sent this old fart a cancellation letter. I will plunge into the ACA open market and find a new provider, even if I have to pay more. Why? Well, first and foremost, because I want real insurance that cannot be cancelled or changed at the profit-mongering whim of an insurance company. If I were to remain with the grandfathered fake insurance policy, I would not have the ACA protections. I would still be in the old healthcare system, which was a lie. I would have to hide any serious conditions from them for fear of cancellation. I am healthy now, but for 17 years I struggled with chronic Hepatitis B, and I hid it from my health insurance companies in the independent market, because I didn’t want to be cancelled and denied insurance, which is exactly what would have happened if I had let them know of my condition. Instead I paid for healthcare out of my own pocket on top of my health insurance premiums, and I sought the secret services of free clinics and university medical studies. I know many independent contractors who can tell this same story. That wasn’t insurance. I wasn’t really insured. It was a lie. And besides, now that these virtuous and altruistic health insurance companies (sarcasm) have downgraded policies for old farts like me, it would be dangerous to keep them, because they wouldn’t provide sufficient coverage in the event of hospitalization. We need real insurance and they aren’t providing it now, even though I am paying $7,000 per year for it and I am in good health approaching age 65. In fact, health insurance companies have never provided real insurance to the American public as a whole, while they were denying people coverage for pre-existing conditions, charging women more for the same coverage, cancelling policies when people became sick, and raising premiums 10 or 20% every year so that 40,000,000 Americans could not afford coverage. That was shameful! No civilized society behaves that way. The only sin President Obama has committed in regard to this healthcare debacle was deciding not to direct the role-out of the ACA website personally. He thought he should delegate that responsibility to Internet experts, because he had a few other things to do — chief among them, making sure that real healthcare insurance for all Americans survived its journey through the legislative swamp of Capitol Hill. But no good deed goes unpunished, they say, and President Obama is living proof of that axiom. I predict, however, that a year or two from now, only the most hardened right-wing ideologues will want to return to the days when nobody had real health insurance and the whole system was a lie. The Affordable Care Act will become as cherished and untouchable as Social Security and Medicare, because it will provide a pathway to health and higher quality longevity for scores of millions of middle and lower class Americans who would not otherwise be able to provide it for themselves. First of all, let’s be sure we have our terms straight. The median wage refers to the midpoint of money earned by everyone in the United States. In other words, it is the dollar figure wherein we see half of the wage earners bringing in above that amount, and half falling below it. What is that figure? In a country as rich as ours, you might think the midpoint to be somewhere in the $50,000 to $60,000 range, would you not? But no, it is actually less than half of the higher of these two figures. The American median wage is exactly $27,519.00. Think of it. Half of the people in this enormously wealthy country of ours earn less than $27,519 a year. In essence, this means that more than 150 million people essentially scrape by financially. Remember, too, that the federal poverty guidelines (the amount below which an individual or family is “officially considered to be living in poverty”) stipulate $23,550 for the “typical” family of four people. Therefore, if only one person in a family of four is working, not an unusual situation these days, and if that individual earns some $27,500 a year, then this family escapes “official poverty” only by about $4,000 a year. And if another dependent were to be added, then they are considered to be living in poverty. And that is not all. Before the so-called “Great Recession” hit in 2007, that median income level was actually almost $1,000 higher than it is now. What does this mean? It means that, in the ensuing years since then, and even now after the recession is “officially over,” Americans have actually lost money in terms of median income, and all this while prices for essentials such as food and medical care have gone up. Food costs, for example, have risen more than 12% above inflation in the past 6 years, and medical costs have soared from $1,100 per person in 1970, or 9% of GDP (gross domestic product), to $8,402 per person in 2010, or almost 18% of GDP. The average wage is also another important and powerful indicator. Again, to be sure of our terminology, the average wage is calculated by adding up all of the money earned by Americans (including stocks, bonds, and other interest on investment), and simply dividing it by the total number of people in the country. That average wage is $42,498.00. For simplicity’s sake, let us round it off and call it $42,500. There are a couple of interesting things about this figure, aside from immediately comparing it in our minds to exactly where we fall, each of us, in regard to it. One of these interesting facts is that, instead of it growing, which we normally would expect it to do, it actually shrank during the years of the recession. But it has risen in the past year by almost $500. When the average wage increases at a time when the median wage decreases, this essentially means that the income of those earning above the average wage is rising faster than those earning below it. In other words, the old adage remains true: the rich are, in fact, getting richer, while the poor are getting poorer. Big surprise, I suppose, most people might well say. The above figures are probably the most important ones. However, let us take a look at a few more facts that round the picture out. One is that the majority of the income growth in the last year or so has taken place in the top quarter of Americans. Another, which I find somewhat startling, is that 67% of American workers earn less than the average of $42,500 per year. Put another way, only one-third of workers earn ABOVE average salaries. Obviously, loss of jobs due to the recession has been one of the main culprits. As David Cay Johnston puts it in an on-line article in Al-Jazeera: “Had jobs grown since 2000 at the same rate as the population, last year the nation would have 11 million more people working.” He goes on to point out how this would have meant not only less misery and suffering for those millions who remain unemployed, but think also about the tax revenue lost to the government, which would have helped greatly with the deficit the Republicans are always talking about. Adjusted for inflation, total real wages for most Americans have dropped fully 6% since 2007. But how have those at the top of the job market fared? The top 1% now collects almost 20% of all the money earned in the United States, an astounding figure by anyone’s calculation. Additionally, the income of that top 1% has risen 20%, compared to the mere1% increase for the remaining 99% of us. And if you expand your parameters to the top 10% of income earners, they now hold very close to 50% of all wealth in this country. The largest previous holding of wealth by the top 10% was at 46%, and that was in 1932. Indeed, if you make more than $50,000 a year, you earn more than almost three-quarters of all Americans, and if you happen to make $100,000, you earn more than some 93% of your fellow citizens. It is, therefore, no myth that income inequality is growing very rapidly in this country. The Middle Class is struggling to hold its own, while the poor, or the near-poor, the working-poor as we have all heard, are losing more and more ground. In the meantime, what is Congress doing about all this? Instead of working with the Administration to find ways to get Americans back to work, and in so doing helping to fix an unsustainable deficit, they are dithering and delaying, shutting the government down for no good reason, and refusing to pay the bills we have already incurred. I blame the Republicans mostly for the mess, but if pushed, I could agree that there is blame enough for all involved. You don’t have to have a doctorate in Economics to know what is needed: first of all, fix our unworkable and unequal tax code; second, work on an even-handed, reasonable, and equitable fix related to the growth in so-called entitlement programs; and finally, help people find jobs, jobs, jobs. I’ll pass over saying more about the terrible medical insurance muddle we’ve gotten ourselves into, since the Affordable Care Act, even with its flaws, has gone a long way toward helping to fix that. And why else do we elect representatives and send them to Washington in the first place? People are extremely concerned, and rightly so, and some people are desperate. Let us find a way to work together and fix the problems that actually exist, rather than fighting about issues that, in the end, do not really matter. As we all know from the sonorous words of the Preamble of the United States Constitution, our national purpose must and should always be to “establish Justice, insure domestic Tranquility, provide for the common defence, promote the general Welfare, and secure the Blessings of Liberty for ourselves and our Posterity.” It is possible to do. We have done it before, and if we have the will, the determination, and the good sense, there is no reason why we cannot do it again. It is time for us to stop calling each other names, and instead to name the real problems we are all facing, so that, together, we can do what it takes to actually fix them.